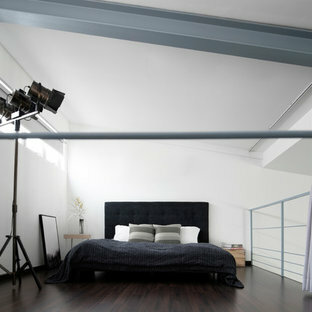 The bedroom is where most people spend a good part of their day unwinding after a long day of work. It’s no surprise then, that we’d put in so much effort and money in making this part of the home delightful. 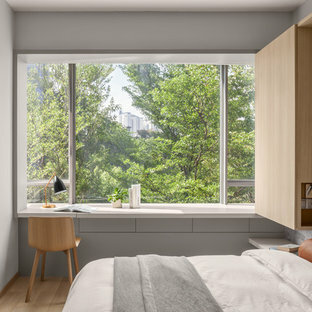 While our small-space living lifestyle might seem to limit options available for bedroom, homeowners and designers have overcome this with many creative and stylish executions. 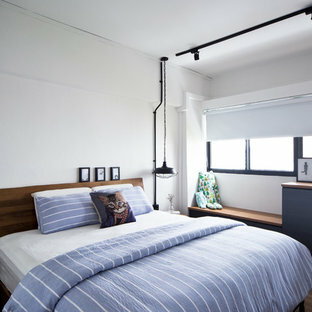 On Houzz, you’ll find limitless design options for the bedroom for the home. 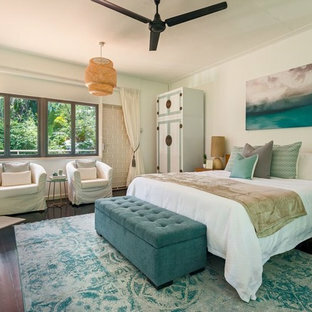 Here are some tips to guide you in finding bedroom inspirations and ideas on Houzz. Which bedroom am I looking to renovate? 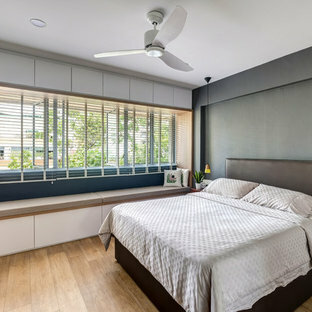 Whether you live in a HDB apartment, condo, or landed property, ask yourself which bedroom you’re looking to renovate and what your goals are. Is it the master bedroom? If so, this might look different from the other bedrooms in your home. 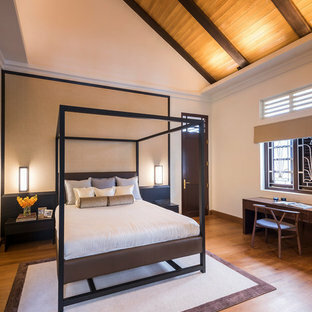 Your search on Houzz might be guided by narrowing down for “master bedrooms”. If you’re welcoming a new member into your household, and are looking to decorate a room for the young one, you should do the same for searches for “kids bedroom”, or have a look in the kids’ rooms photos section. Doing specific searches for “small bedrooms” or “guest bedrooms” might be helpful. If you intend your guest bedroom to double up as a study, be sure to look at the home office photos as well. What furniture and decor do I need for my bedroom? Depending on your bedroom layout and type of bedroom, some of these furniture can do double duty, such as a bedframe or headboard that can also act as storage. Are you looking to do up a guest bedroom to also be a study or home office? Search for bedrooms or home offices with a fold-out / fold away bed or sofa bed. What type of bed would I prefer? Platform beds have become increasingly popular, and it’s also something you can specifically look for within Houzz’s bedroom photos as well. This also works if you’re looking for bedframes with storage, folding, four poster, or canopy beds as well. Do I have a specific theme in mind for the bedroom? Want to bring a little romance into your bedroom? Try searching for “Romantic bedrooms” on Houzz. Looking for some inspiration for that dreamy, white coloured bedroom you’ve always wanted? Do a search for “White bedrooms” will yield lots of inspiring results. Want a calm and relaxing bedroom to come home to each day? Using those exact terms will show you how designers on Houzz have selected specific colours, textures, and layouts to create those moods in this space. How do I make my dream bedroom theme come true? 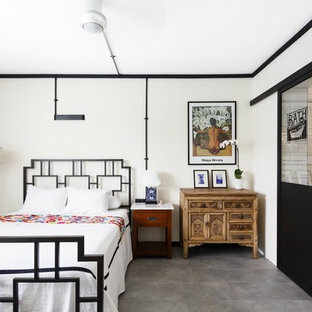 Pay attention to colour and texture choices designers have made in bedroom photos that have caught your attention on Houzz. Take note of the choice of curtains: are they patterned, sheer, or in neutral tones? What about rugs: do they match with the wood, tiled or other forms of flooring? What decorates the walls of these bedrooms? Are there framed photographs, mirrors, or art? Once you have selected and saved these photos and bedroom inspirations into your Houzz Ideabooks, you’re all set to speak to a professional. Work out budgets and communicate preferences with them. Your professional will also be able to give you advice on issues for your bedroom renovation that you might not have considered too.